Galloping Sunlight is an original abstract horse painting for sale by equestrian artist Kent Paulette. There are six brown and black wild horses running forward. Buy this modern art in small & large sizes on canvas. The stampede of horses are in earth tones with pops of color. The background sky is blue and purple. This contemporary equestrian art is made up of colorful geometric shapes that look like stained glass. The powerful galloping horses are kicking up dirt and there is motion in the painting. The style of this fine art has elements of Cubism and Expressionism. The dynamic brushstrokes give this expressive horse painting movement and a bold energy. The horses’ manes are blowing in the wind as they run. 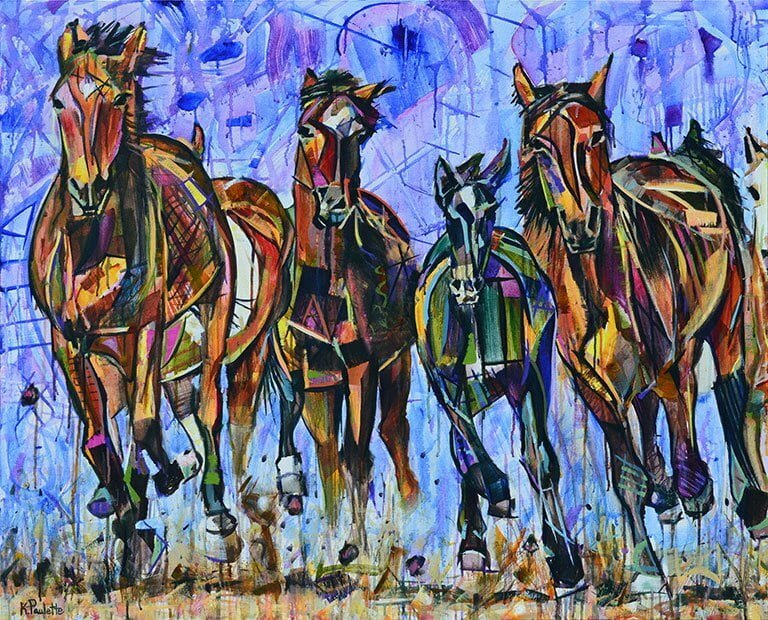 This painting of mustangs has vibrant colors that are bright and contrasting. The angular lines and organic shapes of this wildlife painting give the colts and ponies a modern look. North Carolina artist Kent Paulette painted it in April 2015.